The Brownies is an all-girl section of what goes to make up the Girl Guide movement. The Brownies follows on from The Rainbows - the youngest group for girls in the Girl Guide movement. Brownies are normally aged between seven and ten years old and join the Brownies movement when they have completed their time as a Rainbow. However it is not necessary for a girl to join The Rainbows and she can join The Brownies at the age of seven if she so chooses. What Do The Brownies Do? Upon joining The Brownies a young girl will spend her first four to six weeks learning about the movement and how it operates. She will be allocated to what is known as a ‘six’ – this is a group of six Brownies who will spend time together bonding and building friendships. She will also learn the Brownie Promise and Brownie law. The Brownies are there to encourage learning through fun activities and also relationship building as well as learning the ability to work as an individual and as part of a team. This is done by encouraging them to win Interest Badges: these Interest Badges are awarded for showing aptitude in Agility, knowing about the traditions of the Brownies, Disability Awareness and a great many other skills and interests. During her time the Brownies a young girl will also have the opportunity to learn different skills through activities such as arts and crafts, day trips, etc, communicating with others, learning about the environment, fire safety, home safety and many others. There are also book clubs where book reading tasks are set to encourage the advancement of a Brownie’s reading skills. All through this time the Brownies use two separate books as a means of learning. Each of these books is designed for a different age group: seven to eight-year old and nine year-old. 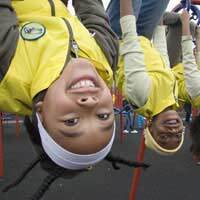 As a Brownie nears the end of her time as a Brownie – prior to moving on to the Guides should she so wish – she will be given the opportunity to engage in other activities which are designed to help improve her skills as a team member and also to encourage her own decision making skills to come to the fore. When a Brownie is ready to move on to the Guides a special ‘party’ is held in her honour to celebrate her time as a Brownie and also to celebrate her achievements during that time. Who Can Become a Brownie? If you wish for your child to become a Brownie then you should consult with your local Brownie Pack leader who will give you all the relevant information and tell you when the next enrolment sessions are. You should find details of such groups in your local library or community centre. @Claire.d - the Cubs allow girls so you may think that there would be no prejudice the other way around. However, you would have to contact the Brownies to ask directly. @Judith Girlguiding North Tyneside is part of the largest voluntary organisation (Girlguiding UK) for girls and young women in the UK. Rainbows for 5-7 year olds follows a programme called the Rainbow Jigsaw, through which they can take part in lots of different activities with girls their own age. You can find email them directly at girlguidingnt@btinternet.com for more information about local groups near to you. Or telephone 0191 272 8979. Hope this helps. I am trying to find out if there is a Rainbow group in our area for my granddaughter whois almost 6 years old.We live in the Wrekenton/Springwell village Tyne & Wear area.Hope you can help. Kind regards Judith Doyle. Book Clubs aren't part of the Brownie section (although there is nothing to stop units including occasional book-related activities if the Brownies wish). The main part of the programme is 'Brownie Adventure' and 'Adventure On' which all Brownies work on. Interest badges are an optional extra - for the individual who is interested, some Brownies are keen on them and gain lots, others choose not to work for any. To find out about local units, use the link on the girlguiding UK website.